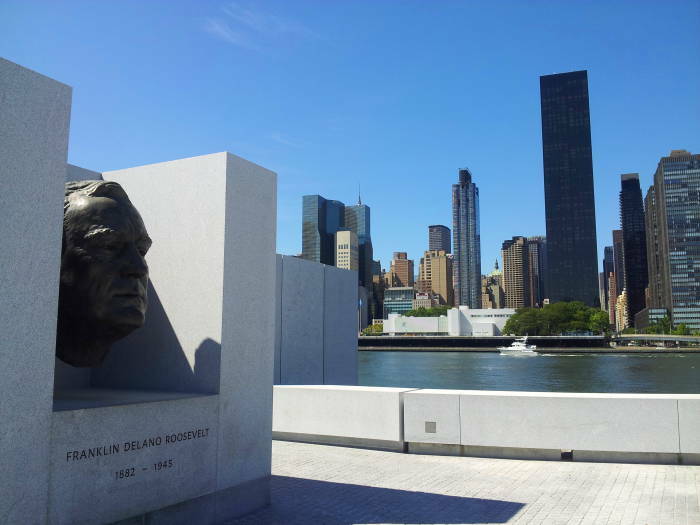 The Roosevelt family is of Dutch origin, and has deep roots in the Dutch-founded New York City, or Nieuw-Amsterdam as it was known back then. The immigrant ancestor was Claes Maartenszen van Rosenvelt, who came to Nieuw-Amsterdam between 1638 and 1649. His son, Nicholas, changed the spelling to "Roosevelt". This New-York-based family includes two former U.S. Presidents — Theodore, who was President 1901-1909, and Franklin, who was President 1933-1945. Theodore was the only President born in New York City, and Franklin lived in the city for several years. Nicholas Roosevelt (1658-1742) was their common ancestor, six generations back. 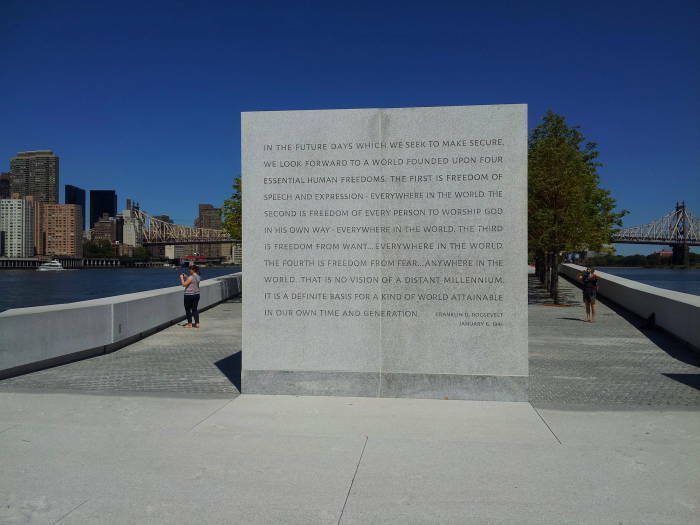 Let's see where Theodore and Franklin lived in New York, and today's Franklin D. Roosevelt Four Freedoms Park on Roosevelt Island in the East River. Official White House portrait of Theodore Roosevelt, 1903. C.V.S. was a very successful importer of plate glass and hardware, and became one of the five most wealthy men in the city. 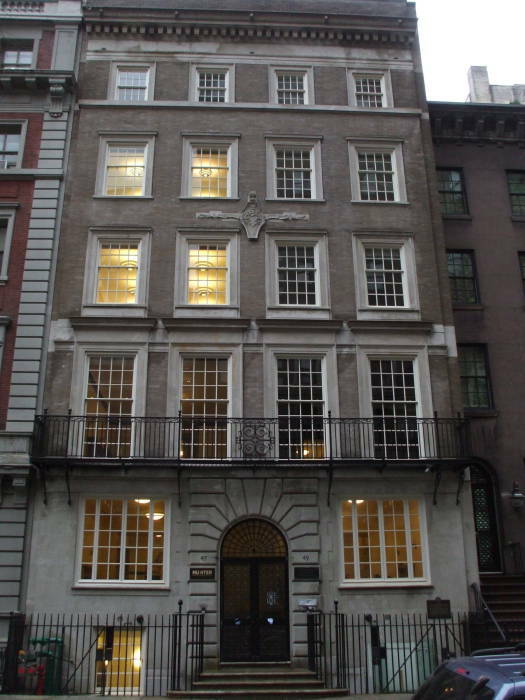 Roosevelt & Son had been founded in 1797 on Maiden Lane in Lower Manhattan, soon after the birth of C.V.S. He was one of the founders of Chemical Bank in 1844, which went on to acquire other banks and become Chase in 1996. By 1850, Roosevelt & Son concentrated on importing plate glass. C.V.S. retired from the company in 1865, and the company continued a transition toward being a banking house concentrating on private banking and investments. In 1876, Roosevelt & Son sold its plate glass operation and became exclusively focused on financial services. The company still exists, doing business since 1946 as Roosevelt & Cross with C.V.S. 's great-grandson one of the founders of the newly reorganized firm. C.V.S. 's son Theodore, known as "Thee", was a very successful businessman and a philanthropist. Thee married Martha Stewart "Mittie" Bulloch of Roswell, Georgia, whose family remained in the south with several members including two brothers fighting for the Confederacy. She was supposedly one of the inspirations for the character of Scarlett O'Hara in Margaret Mitchell's Gone With The Wind. Thee was involved in the founding of the Metropolitan Museum of Art, the American Museum of Natural History, the New York Orthopedic Hospital the New York City Children's Aid Society, and the Bureau of United Charities; and he contributed large sums to the Y.M.C.A. and the Newsboys' Lodging-House. Their second child was a boy, whom they named Theodore, Junior, born in 1858. Two more children followed. Elliott, the third, later had a daughter, Anna Eleanor Roosevelt, who went on to marry her distant cousin Franklin Delano Roosevelt. Thee supported the Union during the Civil War, having been a charter member of the Union League Club which promoted the Union cause. 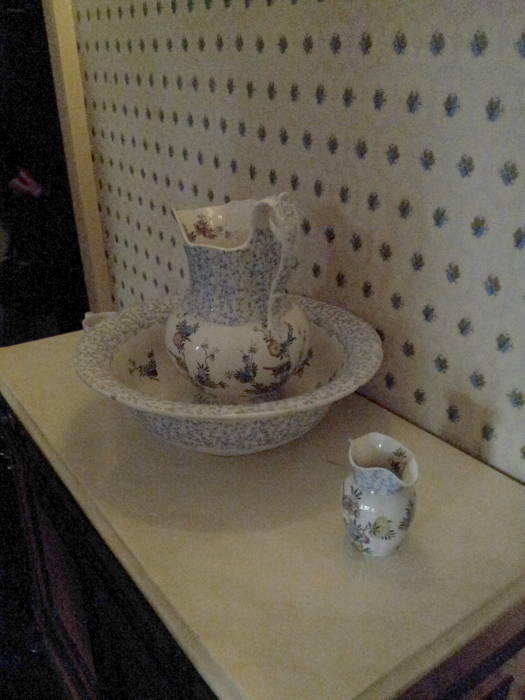 However, when the war started, with his wife supporting the Confederacy and her brothers in the Confederate Army, things were undoubtedly tense in the Roosevelt home. Thee hired a replacement to take his place in the Union Army. Thee and two associates developed the Allotment System, which they convinced Abraham Lincoln to urge Congress to accept. It was an army payroll deduction program to provide support for the Union soldiers' families. One third of a participating Union soldier's pay was sent to his family back home. Thee and Mittie were living in a brownstone at 28 East 20th Street when their second child, Theodore, Jr, was born in 1858. His older sister had scoliosis, young Theodore had severe asthma. The asthma interfered with Theodore's physical development. Asthma attacks in the middle of the night caused sensations of being suffocated. Doctors had no cure, but the medical thinking of the time encouraged his parents to give him coffee and whiskey and, strangest of all, to blow cigar smoke in the face. What really worked was when his father set up a gymnasium on the rear porch accessed through one of the children's bedroom windows. Theodore set out to build up his body, and continued to lead "the vigorous life" from there forward. His debilitating asthma had led to his education being mostly from tutors and his parents. With his father as one of the founders of the American Museum of Natural History, young Theodore could indulge his interest in the natural world. The family traveled to Europe in 1869 and 1870, and to Egypt in 1872. Theodore was in much better shape by then, and could keep up with his siblings and parents. 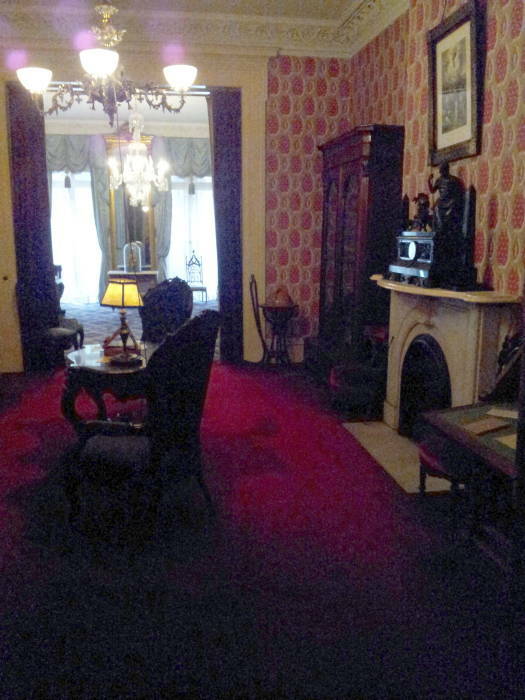 The house had been built in 1848, the Roosevelts had purchased it and moved in during 1854. By 1872 the neighborhood was becoming more commercial. The "Ladies' Mile" area ran roughly south to north from 15th Street to 24th Street, and east to west from Park Avenue South to Sixth Avenue, now called the Avenue of the Americas. Large department stores and smaller specialty clothing shops filled the area. 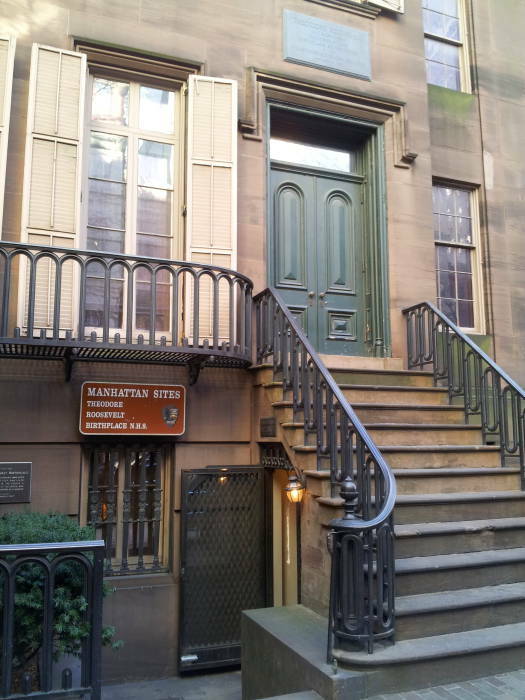 The Roosevelts moved uptown in 1872 to West 57th Street, which was on the edge of the city then. Theodore attended Harvard from 1876 to 1880. Theodore had been elected to the New York State Assembly in 1881, and the publication of his book The Naval War of 1812 in 1882 had established him as a serious historian and author. 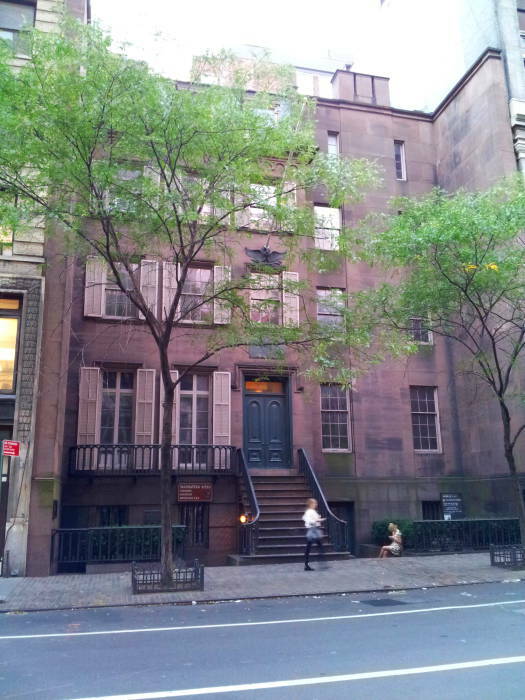 Then, in February 1884, Theodore's mother and first wife died on the same day in the 57th Street house. 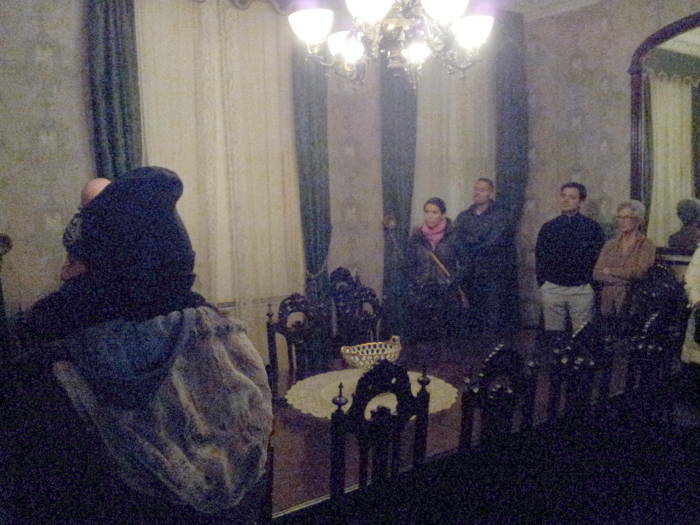 The family came to consider the house as cursed. They moved out, and no trace remains of the house. Theodore left politics and moved to the Dakotas to raise cattle. Blizzards killed most of his cattle and he returned to New York politics. He ran for mayor but lost. From 1895 to 1897 he took charge of the police as the New York City Police Commissioner and radically reformed the NYPD, which had been considered up to then as the most corrupt in the U.S. In 1897, President William McKinley appointed Roosevelt the Assistant Secretary of the Navy, based on his historical research and writing. The Secretary of the Navy was in poor health and mostly interested in formalities, and so he turned over most of the responsibility to his new assistant. That led to Theodore's involvement in the Spanish-American War in Cuba. He resigned from his civilian job with the Navy Department and formed the First US Volunteer Cavalry Regiment, commonly known as the "Rough Riders". 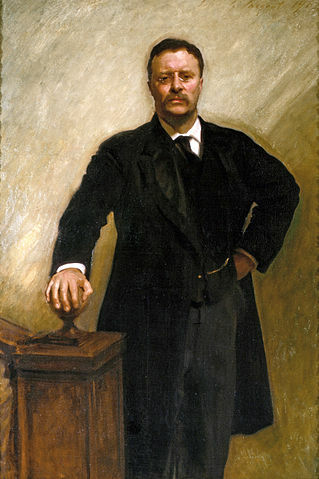 After the Spanish-American War, Roosevelt was elected Governor of New York. From there he immediately progressed to the office of Vice President of the U.S. under McKinley. Theodore was Vice President for just six months, starting in March of 1897. Inaugurations happened later in those years. On September 2nd, Roosevelt first published his signature phrase "Speak softly and carry a big stick, and you will go far." Then, on September 6th, William McKinley was shot by an anarchist. The late 1800s through the first two to three decades of the 1900s were the age of anarchists. Assassination by gun and especially by dynamite was common, plus many dynamite bombings of government and business buildings. It was also the age before antibiotics, and McKinley lingered until September 12th before dying of gangrene and sepsis. Roosevelt advanced to the Presidency. Roosevelt was re-elected in 1904. When that term in office ended in 1909, he went on an African Expedition. It was really a safari organized by the Smithsonian Institution. In 1912 he was back in the running for the Presidency, forming the Progressive or "Bull Moose" Party. A profoundly religious Bible scholar and former bartender named John Flammang Schrank wrote that the ghost of William McKinley had appeared to him in a dream, asking him to assassinate Roosevelt to prevent a third-term President (Schrank and McKinley's ghost would have really hated Franklin Roosevelt). Schrank shot Roosevelt with a .38 caliber revolver at a campaign speech in Milwaukee. The bullet passed through a 50-page copy of his speech and struck his steel eyeglasses case before lodging in his chest without penetrating into his lung. Roosevelt went on to give the speech, and afterwards, doctors decided not to try to remove the bullet. In later years Roosevelt would say of the bullet in his chest, "I do not mind it any more than if it were in my waistcoat pocket." After the failure of the Bull Moose campaign, Roosevelt joined a geographic expedition exploring the course of the Rio da Duvida, the River of Doubt, north through the Brazilian jungle from near its headwaters to where it joined the Amazon. Multiple expedition members died, and Roosevelt was about to commit suicide by morphine to allow the others to continue without needing to support him. He made it back, but critics were doubtful that a former U.S. President had explored a previously uncharted river over 1000 kilometers through the jungle. When he recovered, he presented evidence at a National Geographic Society convention and convinced all the doubters. The home at 28 East 20th Street was heavily modified multiple times, serving as an oyster bar as well as several clothing stores. The house was demolished in 1916. Theodore died in 1919, and the lot was purchased by the Women's Roosevelt Memorial Association. The prominent female architect Theodate Pope Riddle was tasked with creating a replica. 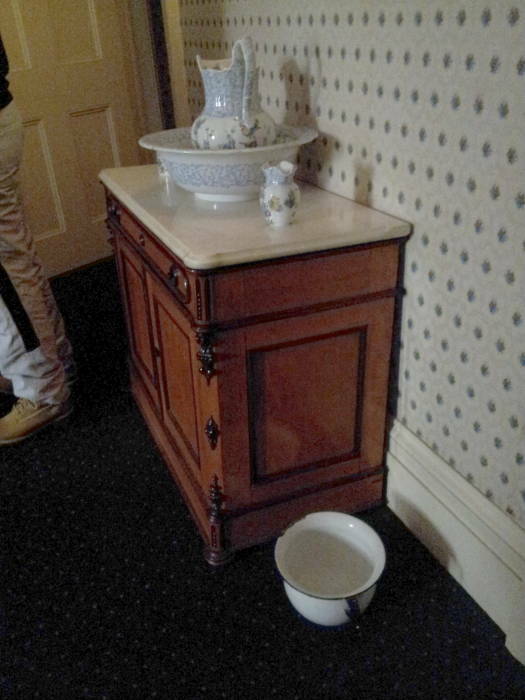 The current building was completed in 1923, designed to replicate the Roosevelt home as it was in 1865. 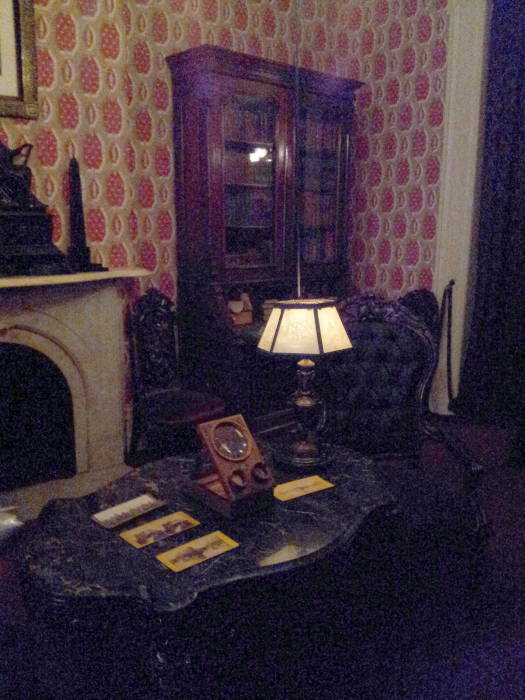 The furnishings are largely originals donated by Theodore's widow and his two sisters. The home was donated to the National Park Service in 1963. It's open Tuesday through Saturday, from 9 AM to 5 PM. 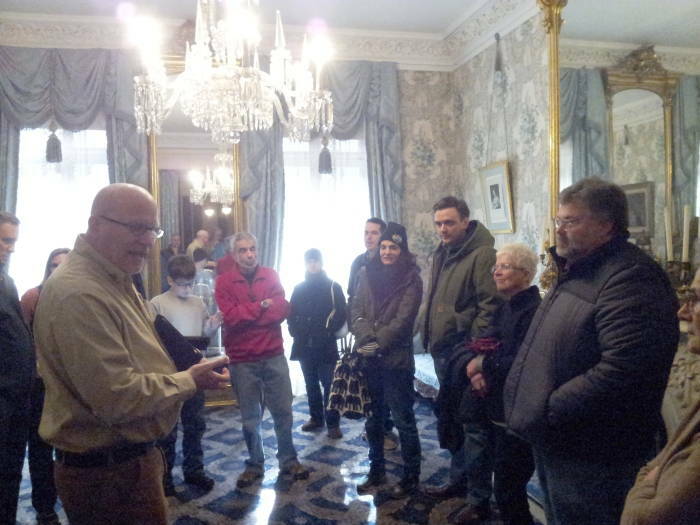 Rangers and volunteers lead tours on the hours from 10 AM to 4 PM. Conversation around this dining table would have been rather tense during the Civil War, with Thee and the rest of the family supporting the Union while Mittie openly supported the Confederacy. The second picture here looks from the dining room, at the back of the house, through the library to the parlor overlooking the street. Natural gas distribution lines extended through the 20th Street area of the city, and the Roosevelts used gas for lighting. A thin copper tube descends from the ceiling to lamps on the central table (although today the lighting is all based on electricity). 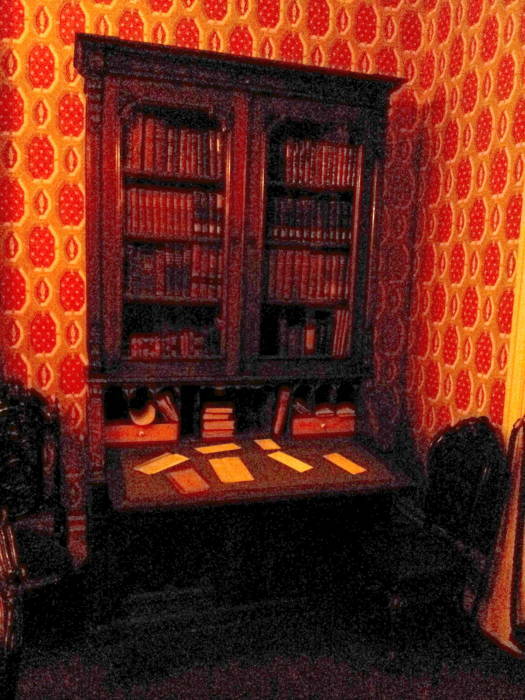 Young Theodore studied in this room. 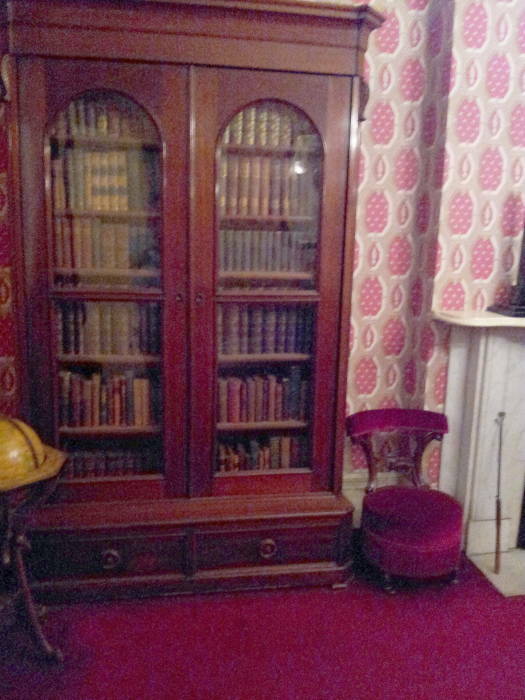 That's his small red velvet chair between the fireplace and one of the book cases. The Croton Aqueduct was built between 1837 and 1842 to bring water from the Croton River in Westchester County to reservoirs in Manhattan. Before that, yellow fever, cholera, and other diseases had led to an unusually high mortality rate. The Croton Distributing Reservoir was an above-ground reservoir at 42nd Street and Fifth Avenue, the current location of the main building of the New York Public Library and Bryant Park. It covered 4 acres (or 16,000 square meters), and was surrounded by granite walls 50 feet tall and 25 feet thick (15 by 7.6 meters). It held 20 million US gallons or 76,000 cubic meters. While gas pipelines reached the house, the water distribution and sewage collection systems did not extend as far south as 20th Street while the Roosevelts lived there. They got their water from nearby wells and cisterns. As for waste, it had to be carried out by hand. 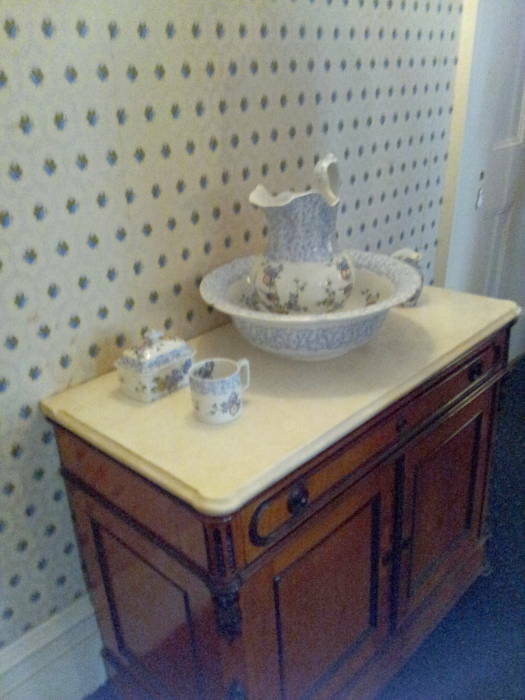 The master bedroom has a large water basin and pitcher plus a chamber pot. Three of Theodore's children, Ted, Archie, and Ethel, along with Theodore's cousin Philip and nephew Monroe, owned the Double R coffee shop at 112 West 44th Street. H.P. Lovecraft and his circle of friends frequented it. 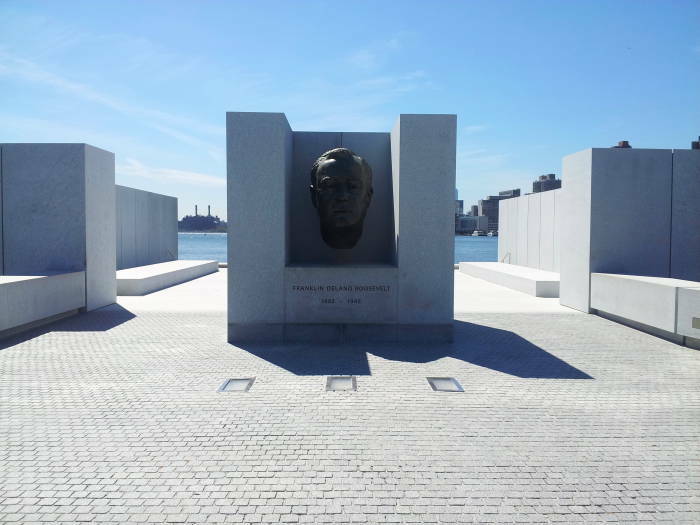 Franklin Delano Roosevelt was born in Hyde Park, New York, on January 30, 1882. He and Theodore were distant cousins. Nicholas Roosevelt (1658-1742) was their common ancestor, six generations back. The family relationships are confusing. Thee's fourth cousin James Roosevelt was the father of Franklin Delano Roosevelt. Thee's son and Theodore's brother Elliott was the father of Eleanor. Franklin served as a New York State Senator (1911-1913), Assistant Secretary of the Navy (1913-1920), Governor of New York (1929-1932), and U.S. President (1932-1945). 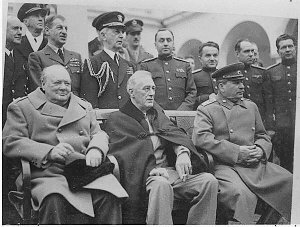 L-R: Winston Churchill, Franklin Roosevelt, and Joseph Stalin at Yalta in 1945. See the CIA's story about how Stalin's NKVD bugged the other two leaders during this conference. 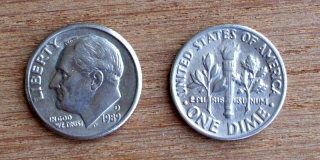 U.S. $0.10 coins, oddly named "dimes", with Franklin D Roosevelt on the face. The name comes from the Old French word disme, meaning "tithe" or "tenth part", in turn from the Latin decima. The National Foundation for Infantile Paralysis had urged everyone to donate "one dime" and was already known as "the March of Dimes" by Roosevelt's death in 1945. Roosevelt contracted a paralytic illness in August 1921. It was thought at the time to be poliomyelitis. He refused to accept a diagnosis of permanent paralysis, and worked at a wide range of therapies. After his election to the presidency, he helped to found the National Foundation for Infantile Paralysis, now known as the March of Dimes. 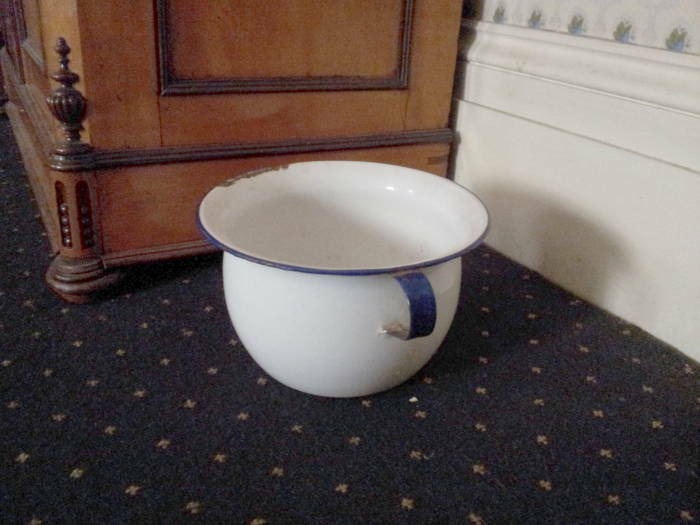 For other pages mentioning polio and iron lungs, see my page about Robert F Kennedy's home water fluoridation system, and also my page about scanning X-ray films and historical radiological hardware. Now that polio is (thankfully) mostly a disease of the past, the March of Dimes fights birth defects in general, premature birth, and infant mortality. And now it's thought that Roosevelt really had Guillain-Barré syndrome instead of polio. That's the conclusion of a study in 2003, "What was the cause of Franklin Delano Roosevelt's paralytic illness? ", Goldman AS, Schmalstieg EJ, Freeman DH, Goldman DA, Schmalstieg FC, J. Med. Biogr. 11(4) : 232-40. Roosevelt's mother, Sara Delano Roosevelt, seems to have been, well, rather strange. As described on the National Park Service's description of Hyde Park, she was the son of a wealthy merchant who made his fortune in the tea and opium trade in China. Franklin was her only child and she "became absorbed in raising her only son, reading to him, giving him baths", and "After the death of her husband in 1900, she became still more single-mindedly focused on her son and his welfare." Franklin went to Harvard, so she moved to Boston to be near him. Then he proposed marriage to Eleanor Roosevelt, his distant cousin, but Sara insisted that the engagement be kept secret for a year. Franklin Delano Roosevelt and his mother Sara, at Hyde Park in 1933. Franklin and Eleanor were married in 1905 despite his mother's machinations. Within two years Sara was building a double townhouse in Manhattan, the left half for her and the right half for the closely surveilled couple. They lived there until he was elected President in 1932. 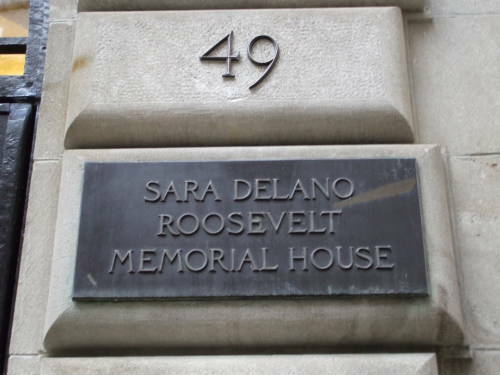 The Sara Delano Roosevelt and Franklin and Eleanor Roosevelt houses in New York, at #47-49 65th Street on the Upper East Side. Here is the double townhouse on 65th Street. Sara lived in the left half, #47. Franklin and Eleanor lived in the right half, #49. The house is easy to find. 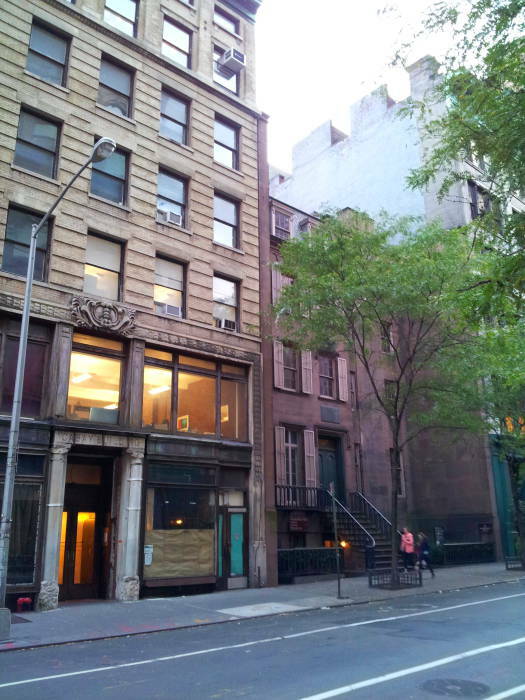 It's at #47-49 East 67th Street, between Madison and Park Avenues. Take the #6 subway line to the 68th Street station, then walk south on Lexington Avenue for one block. Turn right on 67th Street and continue west for a block and a half, across Park toward Madison. The house will be on your right, on the north side of 67th Street. The Roosevelt houses were designed in 1907-08 by Charles A. Platt as English Georgian double townhouses. Behind the central entrance are two units, each with its own entry in the vestibule. The brick and limestone facade features a boldly rusticated arched entry with decorative wrought iron doors, a delicate wrought iron balcony at the second floor, and a stone cartouche on the fourth floor. Sara Delano Roosevelt, who commissioned the buildings, lived in No. 47 and gave No. 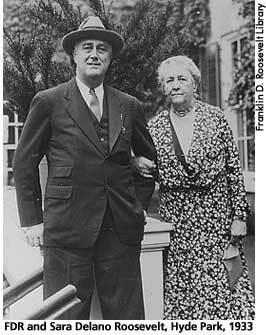 49 to her son Franklin Delano Roosevelt and his wife Eleanor. In this house FDR recovered from polio in 1921-22 and learned of his election as governor of New York in 1928, and as president of the United States in 1932. 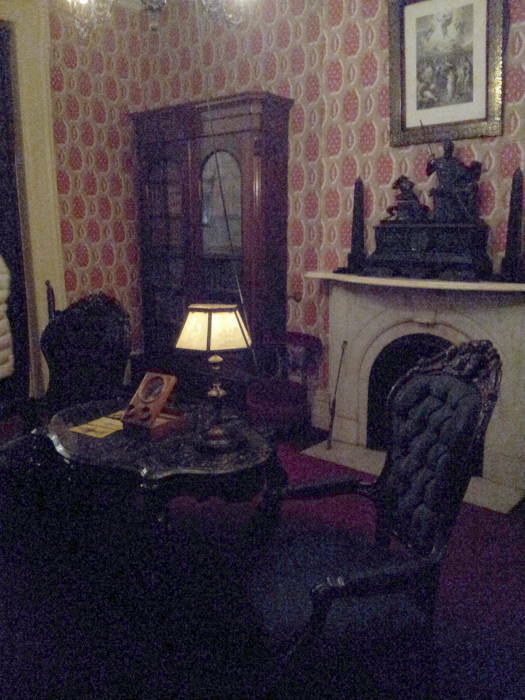 Eleanor Roosevelt held meetings here for civic and political groups as she began her public career. The houses are owned by Hunter College of the City University of New York and have been used by the college since 1943. 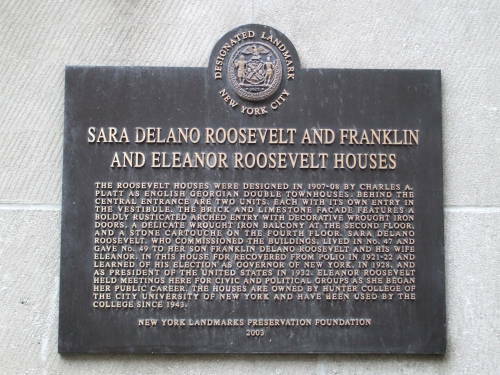 Plaque on the Sara Delano Roosevelt and Franklin and Eleanor Roosevelt houses in New York. In 1919, the Galleani anarchist bombing spree was underway. On the evening of June 2nd, the Galleanisti detonated eight large bombs almost simultaneously in eight U.S. cities. The bombs used up to 11 kilograms of dynamite each, wrapped in heavy metal slugs to form shrapnel. One of the targets lived across the street from the Roosevelts, and Franklin had walked past that home just minutes before the bomb detonated. The explosion killed the would-be bomber, with parts of his body landing on the Roosevelt's doorstep. 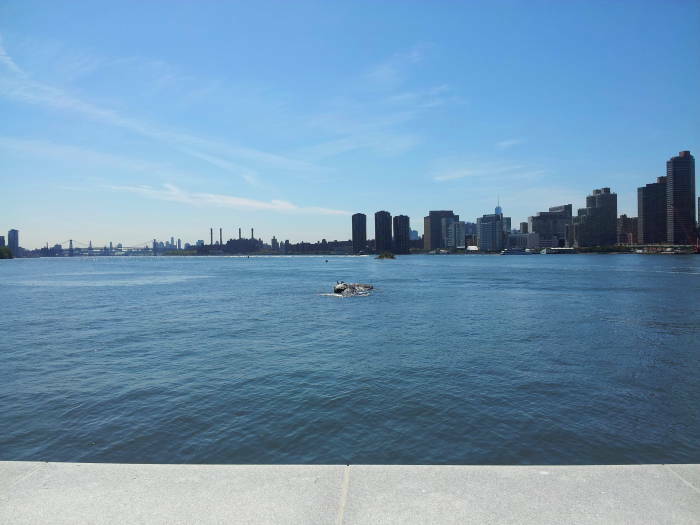 The long island in the East River was called Minnehanonck by the Lenape people who originally lived here. The Dutch purchased it and called it Varkens Eylandt or Hog Island. Then the English called it Blackwell's Island. The city used the island mainly for hospitals and prisons starting in the 1800s. The city purchased the island for $32,000 in 1828, and four year later built the Penitentiary Hospital there to house prisoners. Then the New York City Lunatic Asylum opened in 1839. A workhouse was built to house and use the labor of petty criminals in 1852. 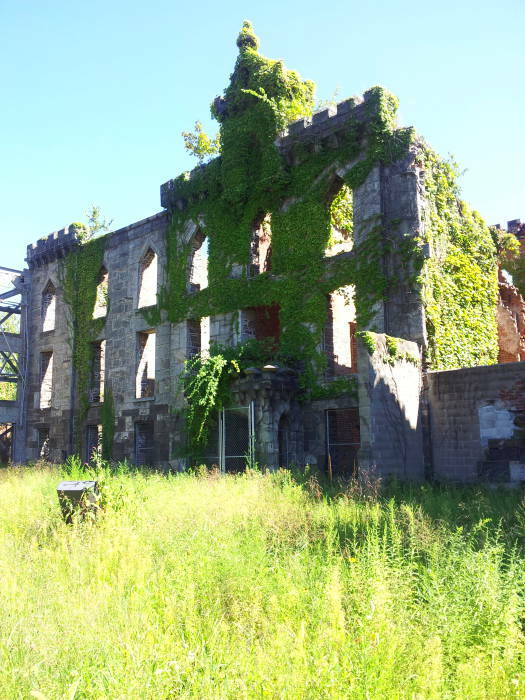 The Smallpox Hospital was built between 1854 and 1856. It is also called the Renwick Ruin as it was designed by James Renwick Jr., the architect of Grace Church and Saint Patrick's Cathedral. The hospital was designed in the Gothic Revival style and faced with locally quarried grey gneiss. It opened in 1856 and had room for 100 smallpox patients. The smallpox vaccine was available, but New York had many outbreaks due to the arrival of infected immigrants. The hospital closed in 1875, and it was converted into a training school for nurses. Further prisons and hospitals were built on the island into the 20th century, and the city started calling it Welfare Island in 1921. 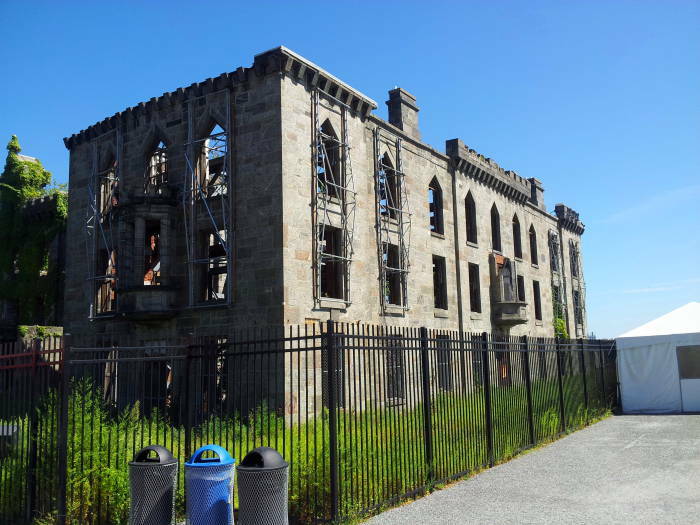 The former smallpox hospital and the training school were abandoned in the 1950s, and then given landmark status and stabilized in the 1970s. Further stabilization work was carried out in 2007 after a storm collapsed a large wall. Chronic care facilities opened on the island in the 1930s and 1950s. In the late 1960s into the 1970s, subsidized apartment buildings were constructed. The island was renamed Roosevelt Island in 1971. It began to become gentrified in the late 1990s. 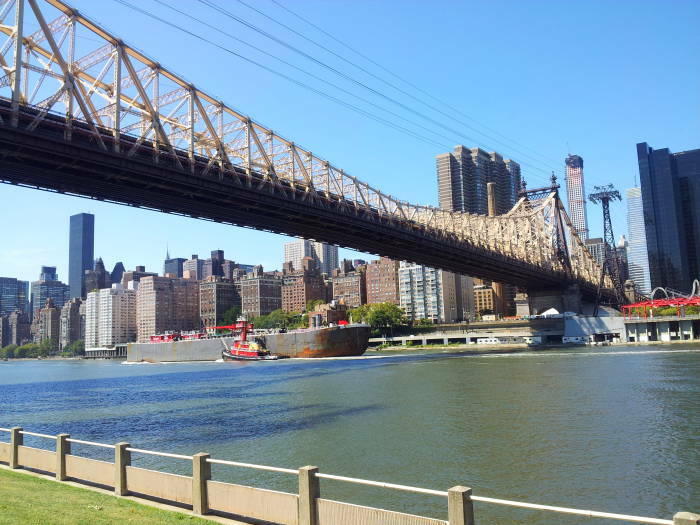 The Queensboro Bridge has passed over the island since it opened in 1909. To get there, you can either take the aerial tram or the F train. It is about 100 feet below street level, the fourth deepest subway station in the MTA. 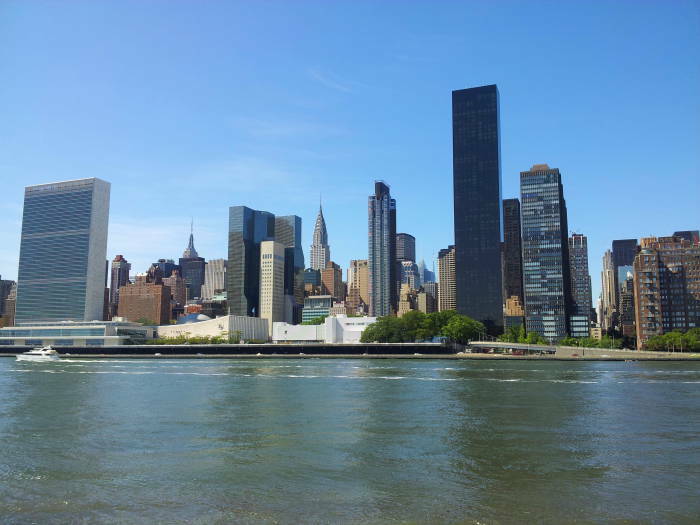 Looking back to Manhattan, you can see the United Nations Headquarters along the FDR Drive running along the East River, with the Empire State Building to its right and the Chrysler Building further to the right. The southern end of the island, around the Smallpox Hospital and on to the southern tip, had been abandoned. 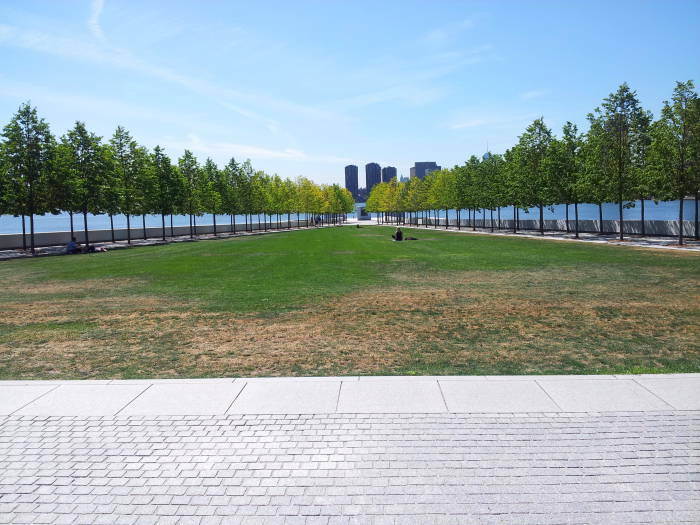 The Franklin D. Roosevelt Four Freedoms Park opened in 2012. It had been designed in 1974, years of litigation stood in the way of its construction. The monument is intended to be a simplified and roofless version of a Greek temple constructed from Mount Airy granite. Looking south, the river curves to the left and then turns back south to pass under the Williamsburg bridge. The Manhattan Bridge and Brooklyn Bridge cross the East River further down, but they're not visible from here. In the future days which we seek to make secure, we look forward to a world founded upon four essential human freedoms. The first is freedom of speech and expression—everywhere in the world. The second is freedom of every person to worship God in his own way—everywhere in the world. The third is freedom from want...everywhere in the world. The fourth is freedom from fear...anywhere in the world. That is no vision of a distant millennium. It is a definite basis for a kind of world attainable in our own time and generation. Theodore was memorialized as one of the four Presidents in the carving at Mount Rushmore, along with Washington, Jefferson, and Lincoln. He is also the namesake of SSBN 600, USS Theodore Roosevelt, a ballistic missile submarine in service 1961-1982, and CVN-71, USS Theodore Roosevelt, a Nimitz-class aircraft carrier in service since 1986.